Anti-Semitic violence increases. Karl-Friedrich becomes head of physical chemistry at the University of Leipzig where Heisenberg is a colleague. 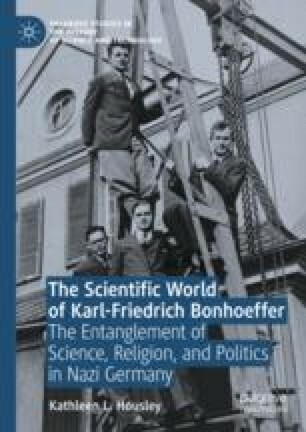 Unsure of his course of action, Dietrich Bonhoeffer accepts a dual pastorate in England in an attempt to gain some perspective, but the theologian Karl Barth upbraids him for doing so. At the Charité Clinic, Karl Bonhoeffer discovers that there are Nazi informants on staff. He comes under pressure to support forced sterilization of mentally ill patients. His partial response is to question whether a mental disease is genetic and to stress accurate diagnosis. He seeks positions for Jewish colleagues outside Germany.